Can Excel create barcodes? Yes, and it’s as easy as downloading the correct fonts. You don’t have to purchase any of those barcode software programs that you can find online unless you need a more unusual kind of code, such as an ISBN or a postal code. Free fonts are available for most of the common barcodes, and fee-based fonts are available for the others (at reasonable prices). There are also many sites that generate barcodes for you, which cost nothing (although some do ask for donations). My favorites include: Online Barcode Generator, which offers (believe it or not) 102 different barcode types, Free Barcode Generator (with 99 different types), and Barcode Generator.org (with 67 different types). Bet you didn’t know there were so many different barcodes. 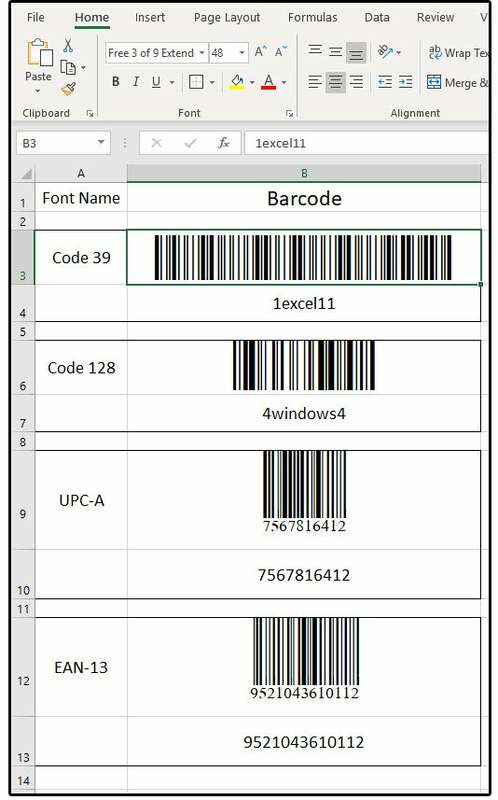 If, however, you prefer to generate your own barcodes in Excel (or Word, PowerPoint, or any other program that uses Windows fonts), you can do that as well, and it’s really easy. UPC-A and UPC-E codes, which means Universal Product Code, are used for consumer products (groceries, household goods, etc.). They are scanned at the Point-of-Sale (POS). EAN-13 and EAN-8 codes, which means European Article Number, are similar in purpose to UPC codes. Code128 codes, which refer to the ASCII 128-character set, are used in logistics for ordering, distribution, and transportation. Code39 codes, which literally means Code 3 of 9, uses 39 digits and characters. These codes are used for the automotive industry, name badges, inventory, and industrial applications. Here’s an example of how to use these fonts. 1. Click Barcode Link to locate and download the free barcode fonts for Code128 and Code 39 (use the Free 3 of 9 Extended font called fre3of9x.ttf). 2. Double-click the link called Download Code 128 Barcode Font. Click the Save button, then click OK.
3. When the Font dialog window opens, click the Install button to add this font to your Windows font folder. Click this link UPC-A Barcode and then click this link for the EAN-13 Barcode. 1. Double-click the button called: Download UPC-A Font (do not click the Start button). 2. Click the Save button, then click OK.
4. 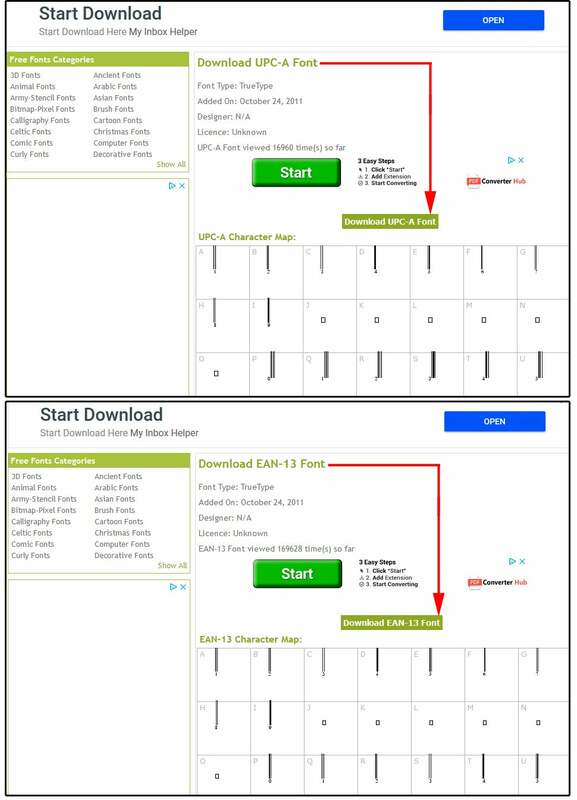 Repeat steps 1 through 3 for the button called: Download EAN-13 Font. NOTE: To verify that the font was downloaded, open the fonts folder ( C:\Windows\Fonts). Click the Date Modified column to sort by the most recent date that the file was modified. The four font files should appear at the top of the list. 1. Enter the column header Font Name in A1. Enter the column header Barcode in B1. Enter the following information into cells A3, A6, A9, and A12: Code 39, Code 128, UPC-A, and EAN-13. 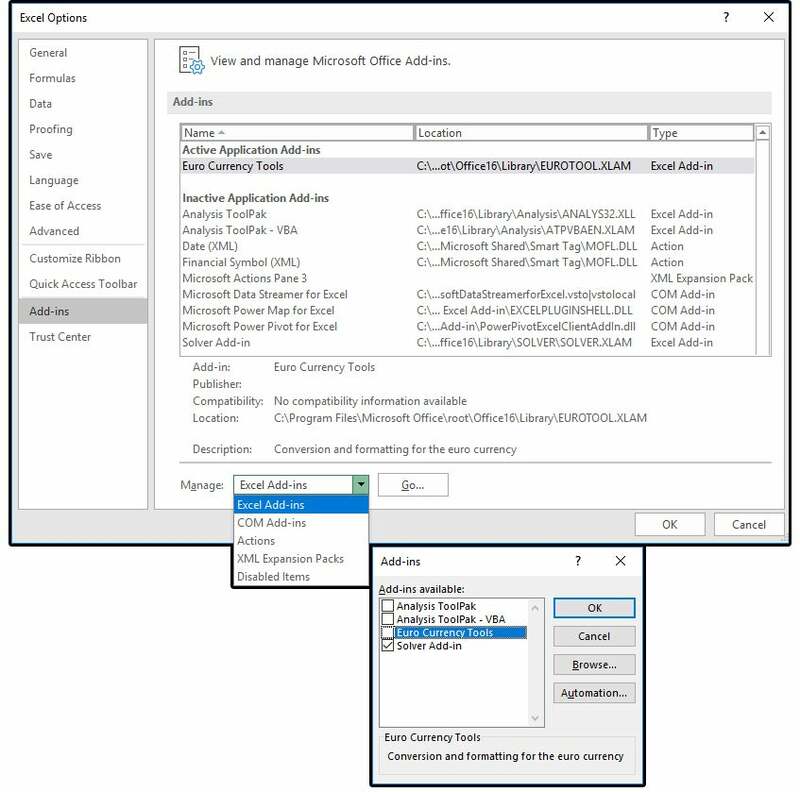 Enter some product names consisting of numbers and text in B3 and B6, such as: 1excel11 and 4windows4. Copy the same text into cells B4 and B7. Enter 10 numbers in cell B9 and 13 numbers in cell B12. Copy the same names into B10 and B13. Position your cursor on cell B3 and select font 3 of 9 Extend from the Home tab, Font group. Click the small arrow in the bottom-right corner to display a list of all your system’s fonts in the C:\Windows\Fonts folder, then scroll down to the applicable font and click it. Move your cursor to cell B6 and do the same as above, but select the font called Code 128. Repeat step 5 for cells B9 and B12, selecting fonts UPC-A and EAN-13, respectively, from the list. Now you can just enter the barcode numbers and select the applicable font to get a usable, scannable barcode for the products you carry. Unless you create hundreds of barcodes a week, I recommend using one of the free online barcode generators mentioned above or (if applicable), one of the free barcode fonts listed above. There are add-in programs you can use in Excel to create these barcode fonts, but they are neither free nor cheap. All three programs listed below, however, offer free trial versions. 1. 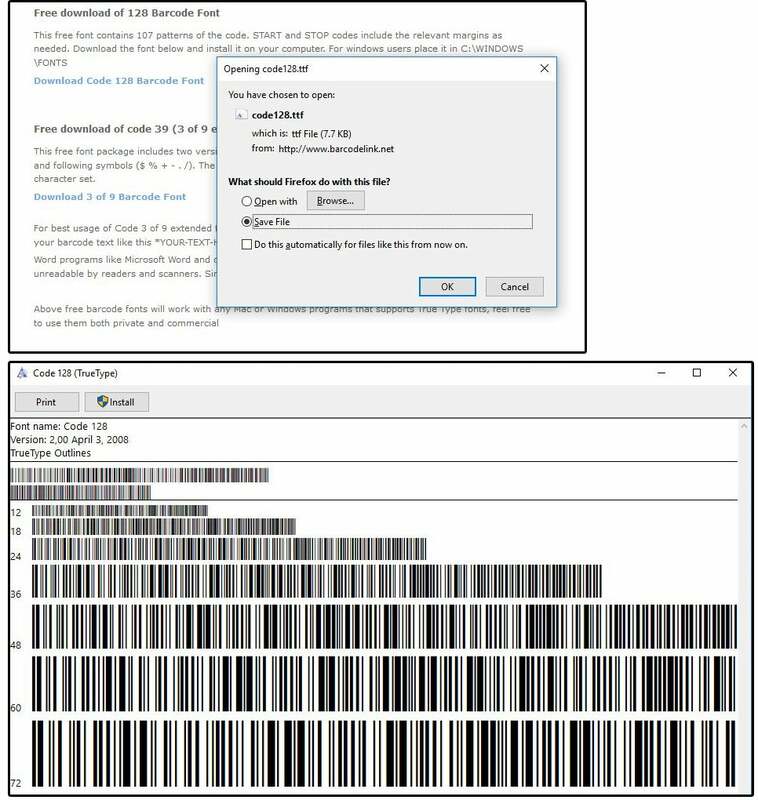 TBarCode Office MS Add-In – For a single license, one computer, this one costs $104. You can try a free demo version from this link. 2. 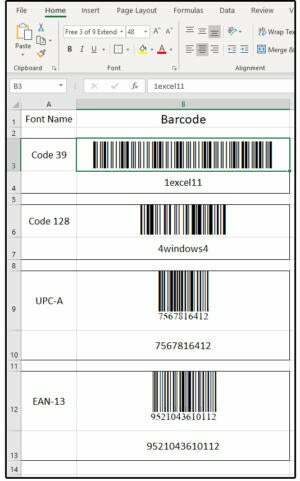 Barcode Generator for Excel – A single license for this one is $159. 3. 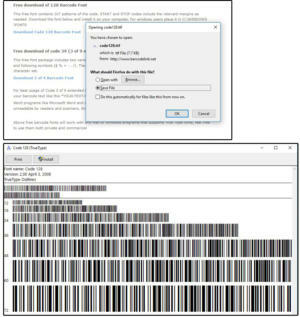 ConnectCode Barcode for Excel – The single license for this one is $149. If you decide to use one of the add-ins, use these instructions to install the program onto your system. 1. Select one of the add-in programs from the links above. 2. When the website opens, click the Download or Buy Now button. NOTE: Most programs are intelligent enough to place the add-in program in the appropriate Excel folder. If that doesn’t happen, you will need to know where the program was installed so you can tell Excel later when you activate the add-in. 4. With Excel open, select File > Options > Add-Ins. 5. 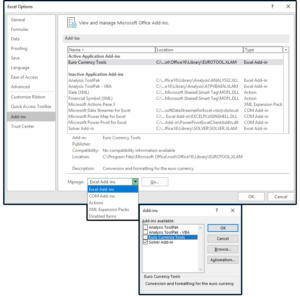 If the add-in you just installed is not visible on the list, click the Manage link (at the bottom of the screen), select Excel Add-Ins from the list, then click the Go button. 6. When the Add-Ins dialog box appears, place a checkmark in the add-in you want to activate, then click OK.
7. 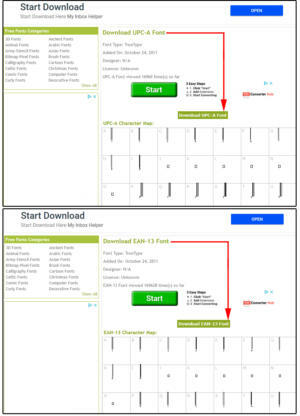 If your target add-in is not listed, click the Browse button and navigate to the new Add-In location, select it, and click OK.
Once the add-in is installed and activated, follow the instructions on the manufacturer’s website to use the new program to create, manage, and print your barcodes. This story, "How Excel creates barcodes" was originally published by PCWorld.